it was an amazing adventure, a sightseeing trip of a life, and golf experience to remember, playing some of the top rated golf courses is the world. We are now planing another trip with Premium Golf New Zealand, based out of Queenstown. There is still so much to enjoy and experience in the South Island." "We had a great golfing holiday and played some awesome courses. Thank you for a great experience in NZ"
"Well run tour with top accommodation and exclusive golf courses"
Gorgeous Trip organized by Premium Golf NZ in 18 courses through two islands. Kauri Cliffs, Hanmer Springs, Terraces Downs and Millbrook were my favourites. Thanks you so much. This company make my trip as a wonderful remember of New Zealand. I played by wonderful views near sea and mountains. "I thought was wonderful despite being overwhelmed by the course and the occasion." "I loved the format of the Gleneagles trip. The practice in the morning and then the round with you. Complete immersion. Gleneagles was also a treat! A brilliant five days!" 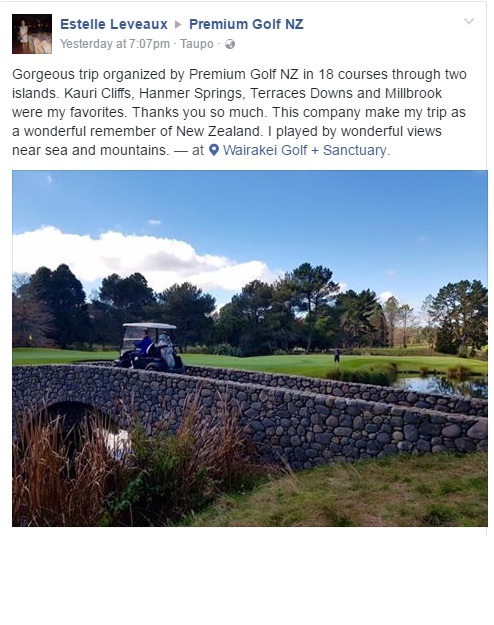 "Good first trip with Premium Golf NZ"
"Great company, the golf courses were magnificent and the weather was great"